In the twenty years since Malian guitar legend Ali Farka Touré won his first Grammy, a whole spectrum of African Blues has become hugely popular with a global audience. The shades of Blues on this Rough Guide range from the deep indigo of the Saharan nomads to a vivid Madagascan cobalt. Africa is considered by many to be the home of the Blues, both musically and spiritually. Musically the connection is particularly evident in the music of Ali Farka Touré and other artists from Mali and Saharan West Africa. Elsewhere, the link to the Blues can be described as more spiritual – the intensity of the emotion comes across in the passion of the voices and the rawness of the music. 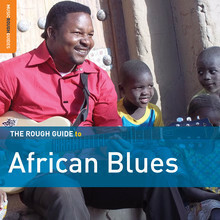 West Africa provides the first few songs on this Rough Guide. Ali Farka Touré himself said that he was ‘an absolute fool for the guitar’ in the 1970s when ‘Yer Mali Gakoyoyo’ was recorded for Mali’s national radio station, while ‘Dani Dou’ by his acolyte Samba Touré hints at the loping gait of a camel-train. Tamikrest and Bombino represent further variations of the blues of the Sahara. Senegalese artists Nuru Kane and Amadou Diagne are joined by musicians from their adopted communities in France and the UK and it’s English guitarist Ramon Goose who provides the springy electric riff to accompany Modou Touré’s vocals in the West African Blues Project. Meanwhile, Zambian-born Dominic Kakolobango is joined by American Elijah Wald on the dual finger-picking guitars of ‘Gueza Tabiya’ (Change Your Habits) and an international band, including oud and piano, provides a lush backing for Amira Kheir’s jazzy exploration of her Sudanese heritage. The complex traditional music of their native Madagascar influences the blues of both Nogabe Randriaharimalala and Lala Njava, while Menelik Wesnatchew’s ‘Teteza’ is a beautifully swaying version of ‘Ethiopia’s majestic hymn to the blues’. Dilon Djindji, from Mozambique, made his first guitar from an oil can when he was twelve years old, 63 years before his first solo album was released. The final track on the album is a unique unaccompanied vocal piece by La Reunion’s greatest maloya artist, Danyèl Waro. This Twin CD is the Best of the Best, if you are new to African Blues, this is the CD set to start with, you will not be dissapointed, another quality CD collection from World Music Network label in London. Available from your local quality World Music record store, Amazon or online from WMN.